Kick off your visit on the 1st (Sat): take an in-depth tour of Birmingham Civil Rights Institute, then get curious at McWane Science Center, then admire the masterpieces at Birmingham Museum of Art, and finally examine the collection at Barber Vintage Motorsports Museum. Here are some ideas for day two: take in nature's colorful creations at Birmingham Botanical Gardens, then stroll through Birmingham Zoo, then take an in-depth tour of Vulcan Park and Museum, and finally appreciate the history behind Doughboy Monument at DeBardeleben Park. For other places to visit, traveler tips, reviews, and other tourist information, refer to the Birmingham attractions app . Thomaston to Birmingham is an approximately 3.5-hour car ride. The time zone difference moving from Eastern Standard Time to Central Standard Time is minus 1 hour. In December, plan for daily highs up to 59°F, and evening lows to 41°F. Wrap up your sightseeing on the 3rd (Mon) to allow time to drive to Memphis. Change things up with a short trip to Horseshoe Casino in Tunica (about 44 minutes away). There's still lots to do: don't miss a visit to Graceland, pause for some photo ops at National Civil Rights Museum - Lorraine Motel, explore the world behind art at Belz Museum of Asian & Judaic Art, and contemplate the long history of Sun Studio. To see ratings, reviews, maps, and tourist information, read our Memphis trip itinerary planner. Drive from Birmingham to Memphis in 4 hours. Alternatively, you can take a bus; or fly. In December, plan for daily highs up to 55°F, and evening lows to 38°F. Finish up your sightseeing early on the 7th (Fri) so you can go by car to Hot Springs. Get out of town with these interesting Hot Springs side-trips: Little Rock (Big Dam Bridge & William J. Clinton Presidential Library). And it doesn't end there: admire the natural beauty at Anthony Chapel, test your problem-solving skills at popular escape rooms, steep yourself in history at Medical Arts Building, and don't miss a visit to Bathhouse Row. To see more things to do, maps, where to stay, and tourist information, refer to the Hot Springs travel planner. Traveling by car from Memphis to Hot Springs takes 3.5 hours. Alternatively, you can do a combination of bus and taxi. December in Hot Springs sees daily highs of 55°F and lows of 37°F at night. Cap off your sightseeing on the 10th (Mon) early enough to travel to Dallas. On the 10th (Mon), pause for some photo ops at John F. Kennedy Memorial Plaza, appreciate the history behind Dealey Plaza National Historic Landmark District, then examine the collection at The Sixth Floor Museum at Dealey Plaza, and finally wander the streets of Bishop Arts District. Here are some ideas for day two: admire nature's wide array of creatures at Dallas World Aquarium, then see the interesting displays at Perot Museum of Nature and Science, and then enjoy breathtaking views from Reunion Tower. To see more things to do, other places to visit, reviews, and tourist information, read Dallas visit planner . Getting from Hot Springs to Dallas by flight takes about 4 hours. Other options: drive; or take a bus. In December, daily temperatures in Dallas can reach 59°F, while at night they dip to 41°F. Finish your sightseeing early on the 12th (Wed) to allow enough time to drive to Arlington. The popular saying goes, "Everything's bigger in Texas!" and Arlington exemplifies that maxim. Start off your visit on the 12th (Wed): explore the world behind art at Kimbell Art Museum, take a stroll through Sundance Square, then admire the local landmark of Fort Worth Water Gardens, and finally admire all the interesting features of AT&T Stadium. Get ready for a full day of sightseeing on the 13th (Thu): tour the pleasant surroundings at Fort Worth Zoo, steep yourself in history at Fort Worth Stockyards National Historic District, and then steep yourself in history at The Ball-Eddleman-McFarland House. For traveler tips, where to stay, ratings, and tourist information, you can read our Arlington planner . Arlington is just a stone's throw from Dallas. In December, daily temperatures in Arlington can reach 58°F, while at night they dip to 41°F. Cap off your sightseeing on the 14th (Fri) early enough to travel to Austin. On the 14th (Fri), take a stroll through South Congress Avenue and then get a sense of history and politics at Texas State Capitol. 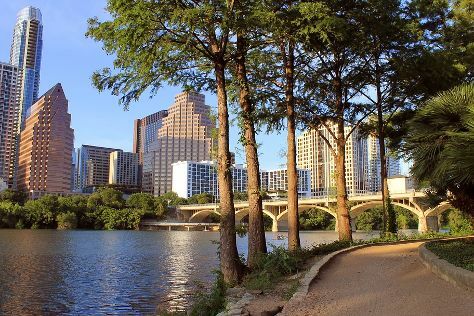 On the 15th (Sat), you'll have a packed day of sightseeing: tour the pleasant surroundings at Lady Bird Lake Hike-and-Bike Trail, then appreciate the history behind Stevie Ray Vaughan Statue, then get engrossed in the history at Bullock Texas State History Museum, and finally test your problem-solving skills at The Escape Game Austin. For more things to do, where to stay, photos, and more tourist information, go to the Austin online holiday builder . You can do a combination of taxi, flight, and car from Arlington to Austin in 2.5 hours. Other options are to do a combination of taxi and flight; or drive. When traveling from Arlington in December, plan for a bit warmer days and about the same nights in Austin: temperatures range from 64°F by day to 45°F at night. Finish your sightseeing early on the 15th (Sat) to allow enough time to drive to Houston. Start off your visit on the 16th (Sun): admire all the interesting features of Minute Maid Park, then tour the pleasant surroundings at Smither Park, and then admire the masterpieces at Museum of Fine Arts, Houston. Get ready for a full day of sightseeing on the next day: examine the collection at Houston Museum District, stroll through Houston Zoo, and then test your team's savvy at popular escape rooms. To see more things to do, maps, traveler tips, and tourist information, go to the Houston trip planner. You can drive from Austin to Houston in 3 hours. Alternatively, you can take a bus; or fly. In December, plan for daily highs up to 66°F, and evening lows to 50°F. Cap off your sightseeing on the 18th (Tue) early enough to go by car to Galveston. An old colonial city and a busy cruise ship port less than an hour's drive from Houston, Galveston sits on Galveston Island and serves as a popular vacation destination for both domestic and international travelers. You'll find plenty of places to visit near Galveston: Kemah (Kemah Boardwalk & Stingray Reef). And it doesn't end there: steep yourself in history at Bishop's Palace, take a stroll through The Strand, make a trip to Tree Sculptures, and examine the collection at Ocean Star Offshore Drilling Rig & Museum. For other places to visit, more things to do, reviews, and tourist information, refer to the Galveston trip planner. Drive from Houston to Galveston in an hour. Alternatively, you can take a bus. December in Galveston sees daily highs of 65°F and lows of 53°F at night. Finish your sightseeing early on the 21st (Fri) so you can travel to White Castle. White Castle a town in Iberville Parish, Louisiana, in the United States. Kick off your visit on the 21st (Fri): admire all the interesting features of Houmas House Plantation and Gardens, contemplate the long history of Laura Plantation: Louisiana's Creole Heritage Site, and then admire the striking features of Oak Alley Plantation. For reviews, ratings, traveler tips, and more tourist information, go to the White Castle route builder app . The Route module can help you plan travel from Galveston to White Castle. Traveling from Galveston in December, you can expect nighttime temperatures to be little chillier in White Castle, with lows of 48°F. Wrap up your sightseeing by early afternoon on the 22nd (Sat) to allow enough time to travel to New Orleans. Start off your visit on the 22nd (Sat): get a taste of the local shopping with Frenchmen Street. On the 23rd (Sun), you'll have a packed day of sightseeing: get to know the fascinating history of Jackson Square, take in the spiritual surroundings of St. Louis Cathedral, stop by Faulkner House Books, then appreciate the extensive heritage of French Quarter, and finally take a stroll through Royal Street. To plan New Orleans vacation without wasting time, ask Inspirock to design an itinerary. Traveling by car from White Castle to New Orleans takes 1.5 hours. When traveling from White Castle in December, plan for a bit cooler days and a bit warmer nights in New Orleans: temperatures range from 57°F by day to 57°F at night. Cap off your sightseeing on the 25th (Tue) early enough to go by car to Mobile. Mobile is the county seat of Mobile County, Alabama, United States. On the 25th (Tue), step aboard Battleship USS ALABAMA, don't miss a visit to Fairhope Avenue, then take a leisurely stroll along Fairhope Municipal Pier, and finally don't miss a visit to Tolstoy Park. Here are some ideas for day two: examine the collection at GulfQuest - National Maritime Museum of the Gulf of Mexico, then see the interesting displays at Mobile Carnival Museum, then pause for some serene contemplation at Cathedral of the Immaculate Conception, and finally make a trip to Dauphin Street. For reviews, maps, other places to visit, and tourist information, read Mobile day trip tool . You can drive from New Orleans to Mobile in 2.5 hours. Alternatively, you can take a bus. While traveling from New Orleans, expect a bit warmer days and little chillier nights in Mobile, ranging from highs of 65°F to lows of 48°F. Wrap up your sightseeing on the 27th (Thu) to allow time to travel to Theodore. Theodore is a census-designated place (CDP) in Mobile County, Alabama, United States. Change things up with these side-trips from Theodore: Fort Morgan State Historic Site (in Fort Morgan), Mississippi Sandhill Crane National Wildlife Refuge (in Gautier) and Point Clear (Lakewood Golf Club & Mullet Point Park). There's much more to do: take in nature's colorful creations at Bellingrath Gardens and Home, revel in the low prices at Tanger Outlets Foley, look for all kinds of wild species at Weeks Bay Reserve, and experience rural life at B & B Pecan Co..
For traveler tips, where to stay, ratings, and more tourist information, refer to the Theodore day trip tool . Theodore is very close to Mobile. In December, plan for daily highs up to 65°F, and evening lows to 48°F. Finish your sightseeing early on the 30th (Sun) to allow enough time to travel to Montgomery. Montgomery is the capital of the U.S. Change things up with these side-trips from Montgomery: Auburn (Jordan-Hare Stadium & Toomer's Corner). Next up on the itinerary: have fun at Montgomery Indoor Shooting Complex, get engrossed in the history at Civil Rights Memorial Center, steep yourself in history at First White House of the Confederacy, and explore the galleries of Alabama State Capitol. To find traveler tips, where to stay, photos, and more tourist information, read our Montgomery trip maker website . Getting from Theodore to Montgomery by car takes about 3 hours. Plan for a bit cooler nights when traveling from Theodore in December since evenings lows in Montgomery dip to 43°F. Wrap up your sightseeing on the 2nd (Wed) early enough to travel back home.